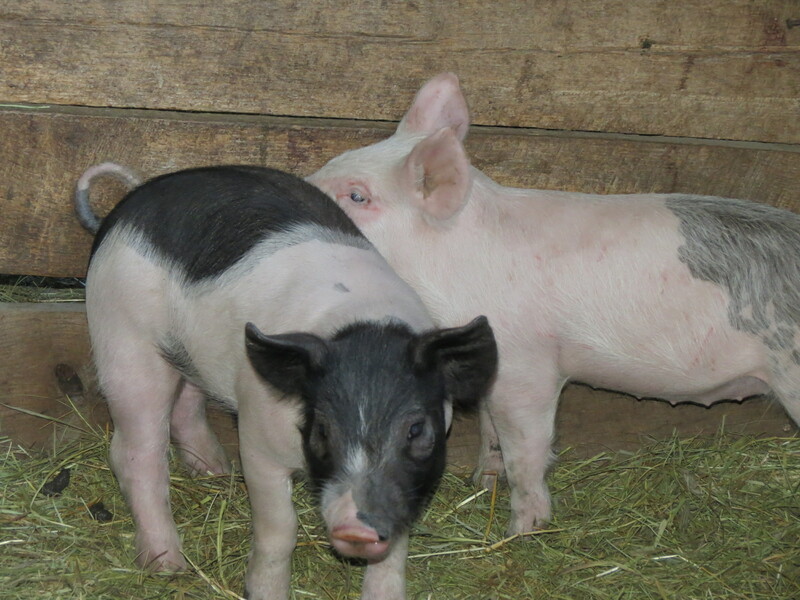 We got our piglets today from one of our neighboring farms. The farm we got them from just raises hogs for slaughter. The farm is interesting, mysterious and curious to say the least. We have never actually been inside the barn they came from, the farmer doesn’t allow visitors in. I do know that it is really dark, I know this from trying to peak inside during the very short period of time the door is open. There are no windows in the barn, and it is kept at 70 degrees all year-long. The farmer raises and mixes his own feed, and I have bought grains from his field before. The piglets I get from him are always healthy and docile, albeit very anxious when they first arrive in our bright world. We raise a few hogs every year for a multitude of purposes. All of the animals we raise here have many purposes. Our piglets help keep our milk fresh. When milk has gone beyond the point of using, we give it to the piglets. Waste not want not. They grow fast on sheep and goat’s milk, and when they are big enough, and it is warm enough, they move to their forever home, at least for the rest of the season. The hogs on our farm work our compost. Our compost is totally vegetarian, and so are our pigs. As the gardens get cleaned of leftover broccoli plants, bolted lettuce, misplaced lamb’s quarter and other wonderful edibles, we feed them to the compost pile which is where our hogs live. We also give them kitchen scraps and whey after making cheese. Their home at this time of the season consists of an old concrete silage shoot that hold 287 cubic yards of debris. We have never had it at full capacity, but I’d like to one day. The hogs eat what they want, and more importantly, they are constantly working the compost heap with their snouts. They also add vital manure to the mix. In the heat of the summer, the pigs stay under a shade tent that Rob made for them over the silage shoot. During hot afternoons, Rob or I will go and spray them with water. They love it, it’s kind of like watching my boys on a slip and slide. This spraying not only cools the hogs down, but it adds moisture to the compost, further helping it to breakdown. When the weather cools, usually late October, our hogs make the ultimate sacrifice. They are around 250 lbs by then, and eating much more voraciously than we can accommodate. We humanly slaughter, with a 22 to the head and process the hogs here on the farm. Ending lives is always the hardest thing to do, but if we are to eat meat, this is the only way we will do it. It is sustainable to us. I don’t feel guilty about our hogs, I feel that the lives they have here are far better than a fate of staying in that dark, densely populated barn, with no one to play with them. I do get attached to them, sometimes that is hard. I respect the way you are living but those piglets are so darned cute, that I would certainly become very attached to them. they are pretty cute! I think they have a good life, compared to the poor animals that are processed by the food industry. I wish life were still so simple for all of the little piggies!